What do I need to bring before my car accident case consultation? 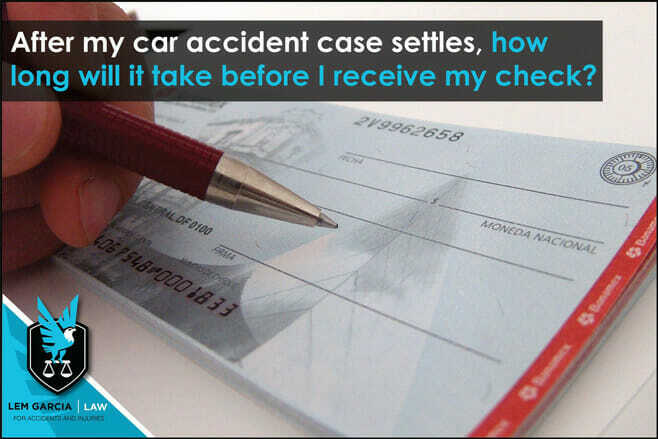 In most situations, you will receive your check within one month, but it can take longer than one month if the insurance company that you settled with takes one month or longer to issue the check and mail it out. Generally speaking, after you sign your settlement release, your attorney will send it to the insurance company and request that the insurance company send the check over to the law office and made out to the law office and the client. This process can take several days, several weeks, or even more than one month. Once your attorney receives the settlement check, the law office will deposit the settlement check into the law office’s IOLTA trust account. Before the law office issues you your check, the law office must make sure that the check clears and is available for disbursement. After the check clears and it is available for disbursement, your attorney will issue you your check in addition to any medical providers that must be paid from the settlement. Once your check is ready, your attorney may either have you pick it up or mail it out to you. Usually, it is best if you pick up your check to prevent the settlement check from getting lost in the mail. It is best practice to pick up the check as soon as possible to prevent the check from getting lost or into the wrong hands after it is mailed. If your are unable to come in, your attorney may be able to mail your check to you via priority mail or even overnight it to you. Here at Lem Garcia Law, we understand that you should receive your money as safe as possible and as quickly as possible. That’s why whenever we receive a settlement check, we deposit it right away and disburse payment as soon as the check clears. If you would like us to overnight it, we will pay for it. However, we do prefer that you come by to pick up your check so we can thank you for your business and tell you how it has been a pleasure to represent you. If you’ve been injured in a car accident, call West Covina car accident lawyer, Lem Garcia for help right away. We’ll help you out as soon as possible and get your settlement check out to you as soon as possible. By: Lem Garcia, West Covina car accident attorney.